Peet’s Coffee & Tea recently announced that its Anniversary Blend 2011 will now be available for coffee lovers to try. To promote the new blend, Peet’s Coffee & Tea held a coffee tasting affair where participants were given a taste of the Anniversary Blend 2011 coffee. Not only were participants able to taste one specific type of coffee, they were also able to try coffee blends from other countries. A 15% discount was also given to customers who purchased the Anniversary Blend, as well as other featured coffees. Peet’s Coffee & Tea stores offer free tasting at specified times. For this year, the Anniversary Blend’s base is a special blend of coffee originally from Costa Rica. The coffee comes from the estate of Doka, a place located just outside of San Jose. A cup of this special coffee is broad and has great body and acidity. Flavors for this coffee have been described by most as being forward and bright, as well as elegant and citrusy. Complementing this special coffee from Costa Rica are two other coffees especially selected for the Anniversary Blend, the Antigua Guatemala coffee and the Burundi black cherry-like coffee (exclusively available online at the company’s website). Both coffees have been described to be bold, brilliant and smooth. Both coffee flavors also give a hint of fruit, flower and sugar. 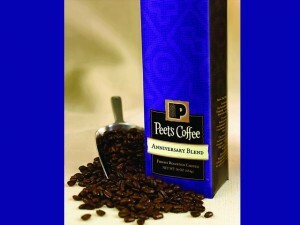 Peet’s Anniversary Blend 2011 is the company’s offering for its 45 years in the craft of coffee blending. It is important to take note however, that this special product from Peet’s is available only for a limited period.